The highland air in Thika that Sunday morning was warm and damp, as if imbued with the peaceful exhalations of people enjoying their one day off in seven. I was on a balconied, colonial street in the town centre. An old-school marching band came through town, in uniform, lifting feet and sticks, beating drums and tooting horns. There were few onlookers to take any notice, and I had no time to drop my plans and follow them to wherever they were going, or to find out why. Instead, as they shuffled past, I was drawn into a shop selling rock salt for animal feed, in pink chunks, like quartz, each lump tied with string like a parcel and labelled with its weight and price. The shop was a traditional store, more like a small warehouse, and the floor was piled high with the rocks. I asked where they came from (“All from Pakistan”) and bought a quarter kilo piece: my livestock should be happy. I was in a risky, effusive mood. A three-month journey around Kenya was ending and I had started spending my remaining shillings on random souvenirs, and all but slapping people on the back as I bade them farewell after each encounter. Three months in Kenya, and nothing had gone wrong. 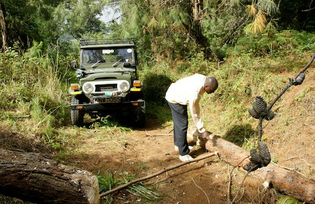 My Kamba driver Ndolo and I were planning to take our elderly but well-preserved Toyota Land Cruiser (green and glossy with the paint that held it together, but betraying its age with its yard-long juddering gear-stick) over the Kinangop – the rugged, forest-shrouded web of ridges that spreads south between the high moorland of the Aberdare range and Nairobi. Twenty-five years ago I had done this thirty-kilometre mud track route in the opposite direction, on one of the earliest examples of a mountain bike, an eager bruiser of a machine created by a one-man company in Telford, called English Cycles. On my English Cycle I had slogged up from Naivasha in the Rift Valley, found the muddy track to Thika leading out of the clutch of highland shops and houses called South Kinangop, and worked my way along it, through the course of the day, until finally rejoining tarmac, tea shops and transport at a place called Gatura. I found a bus there, and the bus touts heaved my bike onto the roof and dropped me in Thika. Ndolo and I exited the last roundabout on the edge of town. Disappointingly, Thika is not redeemed by the profusion of flame trees you might expect from its famous literary connection, Elspeth Huxley’s The Flame Trees of Thika. But nor is it “Your Industrial Town, the Birmingham of Kenya”, as a municipal welcome sign unwisely proclaims. Instead, it’s a ragged satellite of Nairobi, prosperous – as much as any Kenyan town can be – on its plantations of sisal and Del Monte pineapples. Beyond the town limits, the picture was different. We climbed steadily along the valley of the Chania River, through shambas – smallholdings – and villages with Kikuyu names: Gatanga, Kirwara, Rwegetha. There were churchgoers about, in their Sunday best, but also barefoot urchins yelling mzungu (white man) and those for whom Sunday meant nothing – toilers back from an early session in the fields, their faces pulled by lifetimes of relentless effort and poverty. Gatura hadn’t changed much in a quarter of a century: it was still a muddle of tin-roofed houses and compounds, tiny groceries, bars and butcher’s shops. We stopped for fuel. As a crowd of eyes focused on me (as if my like had never been seen before), I watched a teenager fix a puncture on a lorry tyre. Using all his meagre weight on his weighty lever, he forced the balding tyre from its rim, deftly painted glue, applied the patch, returned the wobbling tube and, like a miracle, squeezed the tyre back into the rim. I was reminded of my pitiful struggles with bicycle punctures. Filling and payment done (always a long process when the spluttering pump has to be gently coaxed to cooperate by an oily specialist attendant), we once again hit the road. We had been pestered by questions and I had asked Ndolo not to tell anyone where we were going. Having a driver to ferry you around is normal in Kenya. Anyone who has a vehicle is likely to have a driver. The driver’s average daily salary is roughly the price of a gallon of petrol. In fact I was paying Ndolo rather more than that, and expenses on top. His per diem was actually larger than his wage, and while I could have been more deft in aligning what he was spending with what I was giving him, I had soon found myself often enough sharing my room and paying for the meals we ate together. Although aware of the economic argument that you should always broker the lowest price acceptable to both sides, still, considering our divergent financial positions, I felt it was only fair. Ndolo had a wife and two children. In Nairobi, he ran a small mobile phone accessory business. This driving job, arranged through a mutual friend, would supplement his income, and especially help with the school fees that every parent is faced with. He spent several minutes every day on his mobile talking to his wife, and occasionally had terser exchanges that I took to be business-related. We were on excellent terms, but his English was not fluent, my Swahili was very rusty and my Kamba non-existent. We didn’t find the long silences problematic. Every morning before we set off, Ndolo spent fifteen minutes cleaning the car, brushing out the dust and sponging a bucket of water over the bodywork. He was always perfectly turned out in pressed trousers, a light safari jacket and a collar shirt in khaki, setting off his handsome, composed face. As we got close to the start of the track, I checked my watch. I had a flight to London at midnight and it was already afternoon. We passed an isolated hamlet by a grove of trees. Three, or maybe four youths were running away from the roadside, darting behind one of the buildings. A head turned back: they were dashing away in alarm. We were past them before it had registered. What was that? I asked Ndolo. I don’t know, he said. Maybe they are afraid of this vehicle. I grasped the significance: the Toyota did have a loud and distinctive diesel voice and its colour was perhaps militaristic. The youths were the first sign to me of a tension that has settled over Kenya’s central highlands in recent years: Mungiki. Mungiki is a gang, or a movement, or a criminal conspiracy or an atavistic cult. Modelled, some say, on the Mau Mau militia who fought the British and the Kenya home guard in the 1950s, Mungiki is shorthand for extortion, kidnapping and terror. The drivers of matatus – collective taxis – in the region, pay protection money both secretly to Mungiki and to the highway police at their roadblocks. Hundreds of people in the highlands have been murdered by Mungiki, and in turn hundreds of alleged Mungiki members have been murdered by the police. Rumours are rife, however, that at some level the two work hand in hand. We left the tarmac and soon reached a simple, padlocked, forestry department barrier lowered across the way. Beyond it, the track snaked past a dark green timber plantation, the incongruous conifers emerging from the red, equatorial soil. We stopped and considered driving around (the barrier was more symbolic than literal), and then a gatekeeper appeared with a key. Yes, you can reach to Naivasha. Some trees have fallen across the way, but maybe you can push them. You can just try. If the way was blocked by fallen trees, our adventure might soon be over. The gatekeeper padlocked the barrier behind us. I was aware of a growing sense of commitment, the vertigo of walking to the edge of a diving board that is higher than you intended to try. 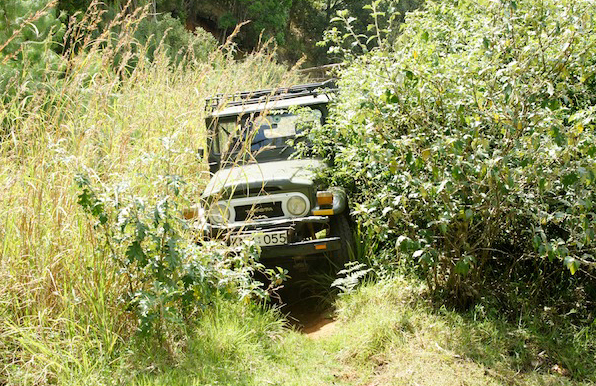 The route was narrow, overgrown with tall grass and obstructed by fleshy-leafed branches. At times it followed the contours of steep slopes, so that we crawled between pressing foliage on one side and a steep drop on the other. 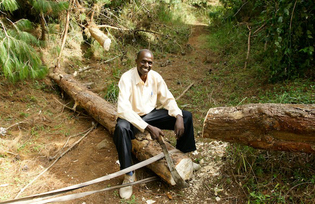 Apart from some woodpiles for charcoal-making there were no signs of people. Elephant droppings, yes, plenty of those, but dry, old ones. The forest was less animated than I remembered: there seemed to be very few birds. We came to a group of houses, eerily abandoned, and then a small, untended shamba, a slumped car and the skeleton of a tractor nearby. The deserted settlement was disturbing, but the forestry service must know about it: it probably belonged to them. We took a wrong turning, the track diving northwards into a steep valley and so overgrown we could barely move forwards. Growling in reverse we withdrew, u-turned, trundled on. Maybe ten kilometres along, we came to a fallen pine tree. 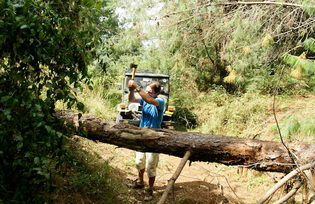 My dicey enthusiasm still undimmed, I took the Toyota’s axe and Ndolo took the machete (both tools stowed by the thoughtful rental company for exactly this purpose) and we set to work on a bole that was no more than a foot in diameter. The unseen, unheard presence of elephants – and the almost unthinkable fear of the Mungiki – galvanized me. Predictably, I hammered with the axe until the blisters slowed me down, while Ndolo attacked accurately and swiftly with the machete. As the photos record, it took us more than an hour to sever the trunk, and we had to do so at both ends. We dragged the carcase out of the way using the tow-strap, and drove on. Five minutes later, we came to not one but three trees blocking the route, and football-sized elephant droppings scattered about. It occurred to me that elephants might well be wise enough to push the trees over to block the road and discourage potentially dangerous human intruders. There was no time to remove these obstructions and every chance of more fallen trees further on. Game over. With the sun dropping behind us, we returned to the forestry barrier. We described the route to the gatekeeper and related our efforts at helping out on maintenance. It was obvious nobody had been down the route for weeks. So you have done well. Where are you going now? We told him we were going south across the valleys to Kiambu and then to Nairobi. His face fell a little and he spoke rapidly to Ndolo in Swahili. Ndolo sucked his teeth regretfully. We drove off, retracing our former route, back to Thika. I looked at Ndolo. He said there can be some you know bad people down there, in the valleys. When night is coming. So we can go this way. Three hours later, Ndolo and I parted in Nairobi, in the dark, in the swarming noise and vehicle fumes of Tom Mboya Street where the matatus played dodgems as they jostled for business, and were emblazoned with slogans – School of Hard Knocks, Ring of Monsters and even Bullet for my Valentine, after the metalcore band. The rental company’s driver was taking me to the airport. Ndolo had a journey across town and a family reunion which he was greatly looking forward to. I took my weary body and bags and rock of salt back to England. Sitting in the car waiting at the traffic lights in Staines, the next morning, I examined my left thumb. The blister had now burst. A light drizzle was falling on the Monday school run. *Richard Trillo* is the author of The Rough Guide to Kenya and co-author of The Rough Guide to West Africa and The Rough Guide to The Gambia.